Let us speak of Pig Ears for dogs. Specifically, let us speak of all natural, grown and made in the USA Pig Ears for dogs. Jones Natural Chews Pig Ears. 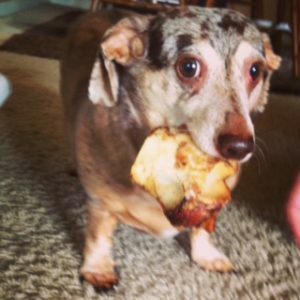 I know, I know – this is Roxy with a bone from Jones. I gave her a Pig Ear for dogs, but she disappeared before I could take her photo. 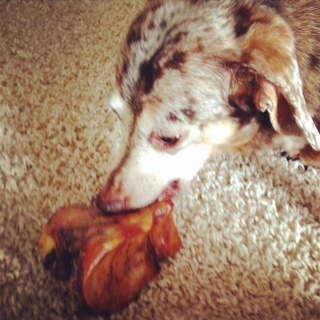 In fact, she darted straight back to a bedroom and hid under a bed so her mama couldn’t take the Pig Ear from her. Y’all would not believe how much dogs love the Pig Ears. Except for Tillman the skate boarding Bulldog. I gave him one and he turned up his snub nose, but his dad warned me that he was uber picky. He’s also uber cute. Fortunately, every other dog to whom I gave the Pig Ear was nuts about it. Pig Ears are an amazing single ingredient treat. They’re like dessert for dogs! 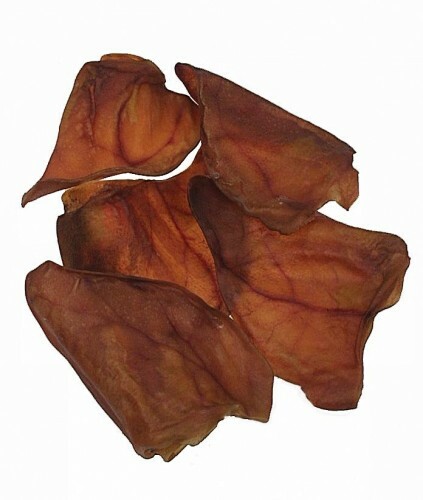 The beauty of the Jones Pig Ears for dogs is that it’s a single ingredient treat. I’ve had dog owners ask what Jones adds to the ear to make it glisten and taste so good, telling me other companies add things to their pig ears for that reason. Shocked, I asked Suzy what was coating the ear. Her response? The fat from the ear. They add nothing. Zero. Nada. Zilch. It’s just a pig’s ear. Period. What is this, Roxy? What are you chewing? Is it something all natural and delicious from Jones? Why, it is! What does Jones have to say about their Pig Ear? Dogs love them! We love our dogs! So when he eats this crunchy delicious chew, remember it is like eating your favorite dessert. USA Pig Ears are what we are all about, along with being naturally baked with no additives. Great dog chew for all size dogs. And just like dessert, the Pig Ear is meant to be a treat, not a meal. This treat is high in protein, but also high in fat. One Pig Ear goes a long way. I recommend, for small dogs, that you take the ear away after five minutes of chew time, and save the rest for another day. 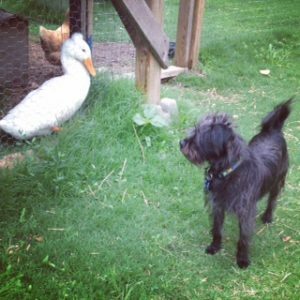 Which might not earn you brownie points with your dog. Dogs seriously love the Pig Ear. Giving it up after five minutes might make you the enemy. The Pig Ear is drool worthy. 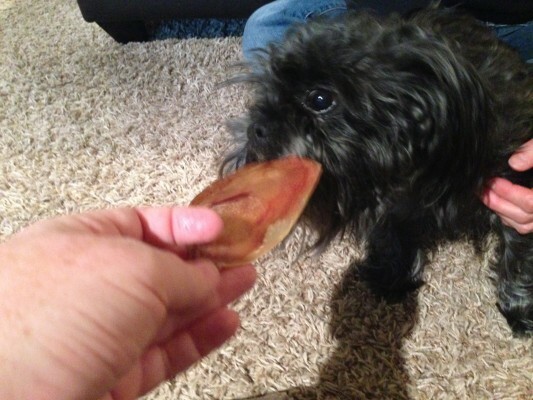 This is Scout the Affenpinscher with a Pig Ear from Jones. I can’t leave you without a happy reunion photo. I was SO glad to be home with Jimmy and Chewy. Chewy and Jim were happy to see each other – and to be separated by a fence. It’s a happy homecoming.